Bollywood superstar Salman Khan has a strong northeast connection—his wardrobe. If clothes maketh the man, then Asa Kazingmei, 34, certainly has a big role in the creation of the star’s persona. 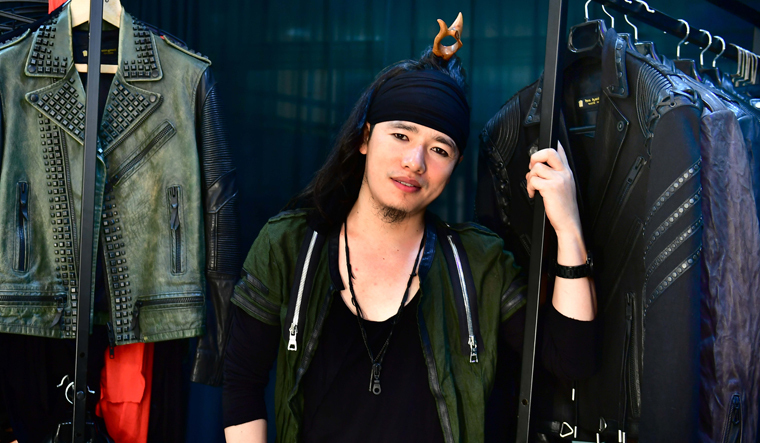 Those denim and leather jackets that Salman dons while appearing on stage have all been designed by this Tangkhul Naga boy from Ukhrul in Manipur. It is said that once the star went shopping abroad, but ended up buying nothing, because he felt that “Asa makes them better”. Asa’s success story started from impoverished beginnings in a remote corner of the country. Even back then, Asa seldom wore a garment that he had not modified himself. He was still studying at a fashion institute in Mumbai when he was spotted by Khan’s designer Ashley Rebello, who asked him to make a few jackets for the star for his film, London Dreams (2009). Ever since, there is scarcely a stage appearance Khan makes without easing himself into one of Asa’s creations. Asa belongs to a generation that is changing the narrative of the northeast in India, bringing about a renaissance in that distant flank of the country. It is a generation that has created a sensory explosion in India, bringing out the sounds, colours, language and flavours of the Seven Sisters to the rest of India and beyond. A generation that is slowly changing set stereotypes about its people as it becomes the cultural ambassadors of its homeland. For decades since Independence, the northeast remained remote, both physically and culturally. The hills and valleys beyond the chicken’s neck on India’s map made news, but always for the wrong reasons. Violence and insurgency, drugs and alcohol and, of course, stereotypes. With not much being taught in schools about the culture and history of the northeast, and with Doordarshan’s limited programming being the only attempt at “integrating” these states, was it any surprise that for the average Indian, the northeasterners remained an alien people, who, when not fighting each other or the Indian Army, wore bones and feathers, did the bamboo dance and ate dogs. Barua points out that two decades ago, there was hardly a northeastern face in Mumbai’s music scene, today the industry is flooded with talent from the northeast. And, for every Papon and Zubin Garg, whose songs fill up people’s playlists, there are so many behind-the-scene sound technicians, says Barua. For both these singers, it was their effort and ability to be versatile and sing in various languages that opened up prospects, raising their status from local stars to national names. A resurgent identity got the opportunity to develop itself when the northeast gradually began easing into a relatively peaceful era. The student agitation in Assam cost many youth an academic year in the late 1980s. Worse, there was a very active United Liberated Front of Assam (ULFA), as well as myriad separatist and insurgent groups active across the eastern Himalayas. Parents of the previous generation worried their children would either join such agitations, or get abducted for ransom. While not gone entirely, the tension has certainly eased in recent years. The northeast may not be on the same page as other parts of the country in the India growth story, but it is certainly catching up with enthusiasm. “Once someone from the community makes a big name, it inspires others to do something similar, too,” Barua explains. There once was a time when a government job was the most important aspiration of a youth in the northeast. It provided stability and regular income, even when the economy was battered with agitations and insurgency. There was little other source of income apart from subsistence agriculture. The government job no longer occupies that coveted spot, and many have dared to even chuck this once ultimate dream to chase a more creative one. Sanjukta Dutta was an engineer in Assam government’s public works department, when she decided to become a designer. In 2012, she launched her brand, Sanjukta’s, resigning from her job of ten years, and immersed herself into her passion. 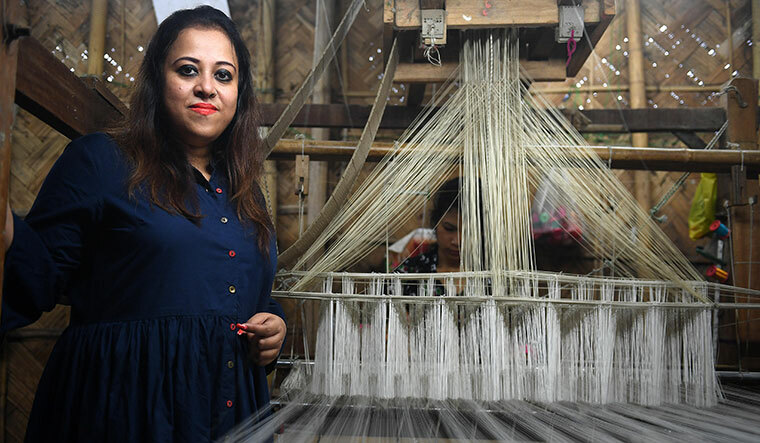 “People said I was being foolish, but it turns out, they were wrong.” Sanjukta’s passion is Assamese silk, and she has done a successful job of promoting the fabrics out of Assam, draping Bollywood actresses like Preity Zinta, Bipasha Basu and Dia Mirza. She even designed the stoles that were gifted to Prince William and Kate during their 2016 visit. Business was not the forte of the northeast. Barring a few local business magnates, much of the economy was controlled by Marwaris and Bengalis. Things are changing slowly, though. “One of the positive outcomes of the present government is that it is easy for small enterprises and startups to get loans,” said Shubhra. Leena Saikia, from Jorhat, was another of those who resigned from a government job and put her training in food technology to entrepreneurial use. She chose the ghost pepper or Bhut jolokia, that fiery hot pepper endemic to north east India, which ranks among the top three chillies on the Scoville scale of pungency. The pepper grew in people’s backyards and was not regarded as anything overly special till 2007, when the Guinness World Records rated it the hottest pepper in the world. Though in the following years, it came some rungs down from the top position, the Bhut jolokia’s celebrity status has not been affected. It is one of the touristy tugs, every visitor wants to see what it looks like, and sample a bit of its fire. Such recognition was an important boost for the pride of these states, and Nagaland soon got a Geographical Indicator (GI) listing for Naga Mircha, another synonym. Saikia sources the peppers from small farms across the Seven Sisters and processes them into flakes, powders and pastes for export to the US, UK, China and Australia. (The domestic market is proving difficult to penetrate because of the price factor. These chillies cost up to Rs 400 a kilo in the retail market, while the fiery Guntur chillies come at a fraction of the cost). But, as Saikia’s enterprise expanded—at present she exports 20 tonnes annually, a good figure for a high value product—she created a demand for farmers to meet. “This is the only cash crop in the region. There is tea, of course, but its economics is an entirely different story,” says Saikia. It is the overwhelming success of people like Atsu Sekhose that inspired several more to take up careers in fashion and design, and today, the northeast is teeming with designers. Naturally stylish and fashionable, many millennials realised there were lucrative careers to be carved from this innate talent. Given some government and industrial patronage, the region could easily become the official design hub of the country, much as Bengaluru developed into the software hub. While Sekhose is firmly entrenched in Delhi’s social scene, there is a host of talent which prefers to stay in the homeland, while managing outlets in one of the bigger metros. The local demand itself is huge, they say. Most of these designers have done shows across London, Paris, Milan and New York, and are change-makers in their own ways. Tourism is still nascent in the northeast. Poor connectivity and social unrest had kept visitors away for long, and apart from military families, few outsiders could get steeped in the northeast experience. Kohima’s Hornbill Festival, which started in 2000, however, was a game-changer. It provided just the platform required for local talent to showcase itself, for visitors to come flocking, and for creating the new-age cultural brew. Many musicians and singers who made it big, got their initial breaks here. Hornbill encouraged other festivals, too. Like the Ziro Festival in Arunachal Pradesh, a celebration of independent music in a breathtaking natural setting. Manipur rechristened its tourist festival after Sangai, that shy endemic deer found near the Loktak Lake, and today, it has evolved as a calendar event in November, showcasing the state’s culture of music, dance, theatre and textiles, and attracting visitors from neighbouring countries like Myanmar, too. The culture of boutique hotels and resorts is picking up, and places like Cherrapunji have transformed into holiday venues. Recent years have seen improved connectivity. The railways came to Arunachal Pradesh four years ago, with a stop at Naharlagun. The Dhola Sadia bridge, India’s longest at 9.15km, opened last year in Upper Assam, shortening the distance to eastern Arunachal. Another engineering marvel, the Bogibeel bridge across the Brahmaputra, is to be opened later this year, connecting Dibrugarh and Dehamji. National Highway 39, running through Imphal to Moreh on the Myanmar border is being upgraded as an international highway, part of the international highway linking India with Myanmar and Thailand. The progress, however, is slow for a region with massive unmet development needs. Ziro town may have got its festival an international recall, but reaching it is an arduous effort, through hours on uncomfortable roads. Chopper services in the region are erratic given the terrain and weather. While the present dispensation at the centre has made noises about development in the northeast, it has not translated as readily into practise. 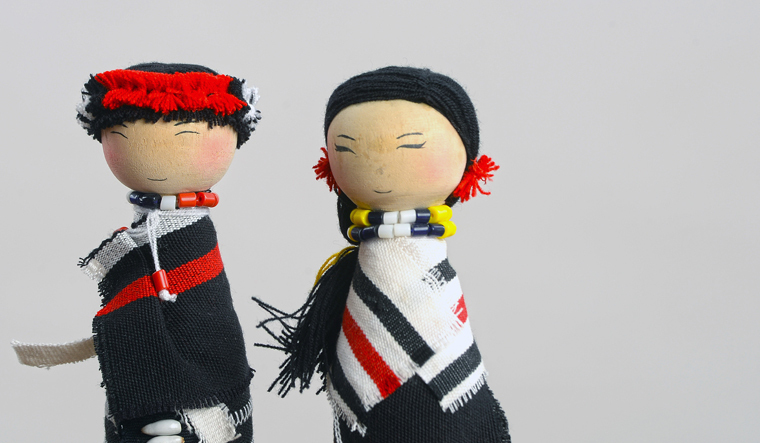 “There is so much talent here that could do with some patronage,’’ said Ikali Sukhalu, a Dimapur-based designer, who has designed uniforms for the Shillong Chamber Choir and whose Naga dolls have been taken by them as gifts to all parts of the world. Action beyond lip service is what this generation hopes for from the Centre. In the meanwhile, they are not willing any longer to berate fate, but are becoming the change they want. A group of Naga professionals, for instance, launched Youthnet to cultivate skill and talent in the state. They have launched a brand, Made in Nagaland, which will provide a platform for smaller artists to sell their creations. As a new era gets ushered in softly into the northeast, there is a prayer on everyone’s lips. Let us hope the winds of change bring goodness, they say. Let the international highway bring development, not drugs. TRADITIONALLY, the northeast or the Seven Sisters are Assam, Meghalaya, Manipur, Mizoram, Nagaland, Tripura and Arunachal Pradesh. While outsiders club them as one entity, this region is culturally heterogenous. Nagaland alone has 16 tribes with distinct entities. Missionary influence is strong in some of the hills; Mizoram, Meghalaya and Nagaland are largely Christian. Assam and Manipur have a strong Hindu influence, as does Tripura. Assam also has a large number of Muslims. The tribal influences are rather strong in the hills. Arunachal Pradesh has, among others, Buddhists, given the contentious border with China. Sikkim is now included in the North Eastern Council by the Centre. It is very different from the other states culturally. Sikkim, which became part of India in 1975, is flanked by Nepal, Bhutan, China and West Bengal. The people here are largely Buddhists. It is one of the most peaceful states in India, there being no problems of underground, insurgent movements. Given the fact that it is a very small state, and also since it shares borders with three countries, it is now considered as northeast for policy decisions like the NDA government’s Act East policy. The northeastern states are expected to be the land bridges, physically and metaphorically, in India’s outreach to its eastern neighbours.